Harem Scarem, House Of Lords, Danger Danger. If you don’t like any of these bands, look away now and steer well clear of In Faith. However, if you are among those of us enjoying the continued revival of eighties-sounding hard rock and hair metal, There’s A Storm Coming might make you very happy. 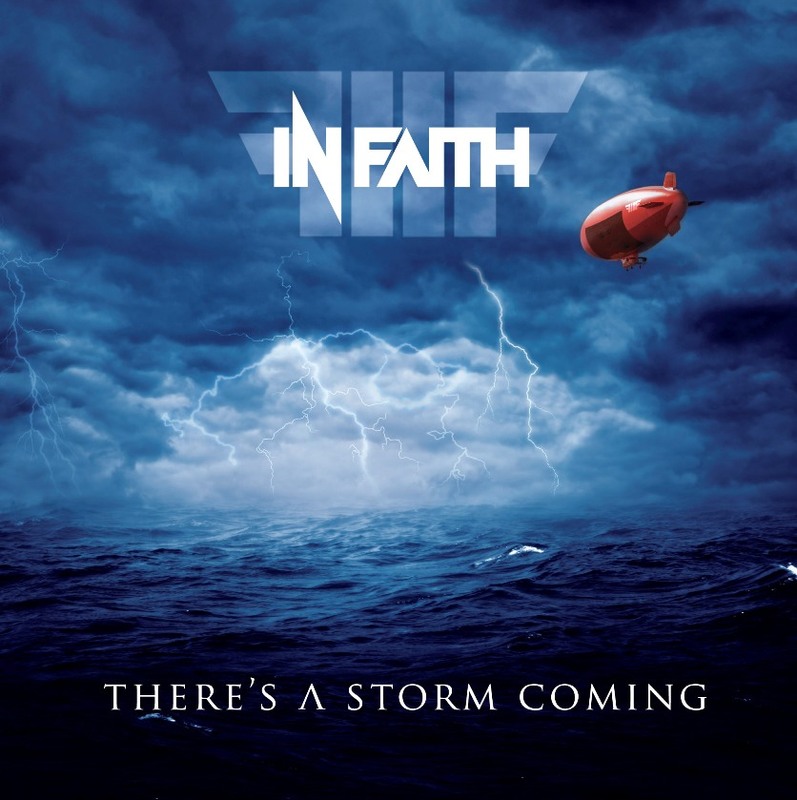 Guitarist Tony Marshall, vocalist Pete Godfrey and drummer Pete Newdeck have played in various rock bands over the last few years, coming together to form In Faith in 2013. It’s evident right from the start that these chaps have a knack for producing catchy, immediate rock tunes. Opener “Radio” is an upbeat, eighties-sounding rock song with vocals similar to Danger Danger and a tune like Harem Scarem. It’s a catchy, feel-good rock tune, with quite a simplistic chorus. The problem with immediate songs is that they can become tired after a few listens which is what happens a little with “Radio” and moreso on some of the other songs on There’s A Storm Coming. Fifth track “Addicted” presents a big step up in the band’s songwriting. It has a big, memorable chorus, an excellent and fairly heavy solo. It’s a great tune that has enough about it to maintain interest through several repeat plays. “All Or Nothing” is another winner with plenty of replay value and has a chorus that sounds like vintage Danger Danger. Another influence appears later on in the album, as on “In Flames” there are hints of Def Leppard; Godfrey sounding more than a little like Joe Elliott at times. This is followed by “A Million Ways”, which includes Leppard-like vocal harmonies and a chorus that strays into AOR territory. The latter is the more effective of the Leppard-reminiscent doublet and one of the best songs on the album. Final track “A Bitter End”, rather than leaving a bitter taste, closes the album in powerful fashion. More eighties acts come to mind here, with the guitar sound occasionally recalling White Sister and brief moments when the combination of lead and backing vocals sounds like Rough Cutt. Again the chorus brings to mind Harem Scarem, probably the band In Faith resemble most closely over the course of the album. For anyone pining the eighties sound of some or all of the bands here, you could do a lot worse than check out There’s A Storm Coming. It’s full of good, catchy songs, with three or four very good ones and some top-notch guitar solos. There are a few parallels with another band, Angels Or Kings. Both British, both are manned with veteran musicians, both have recently released their debut album and both have done a great job recapturing the sound of eighties rock. For me, Angels Or Kings have come out well on top this time, but hopefully there will be lots more to come from both bands. Indeed, talk of them playing on the same bill in 2015 is a mouthwatering prospect. This entry was posted in Reviews and tagged Angels Or Kings, AOR, british, Danger Danger, Def Leppard, hard rock, Harem Scarem, House Of Lords, In Faith, Joe Elliott, Rocktopia, Rough Cutt, There's A Storm Coming, UK, White Sister.